In Sanskrit, manduka means frog. Interestingly, frogs are known for their amazing sense of hearing and male and female frogs can be differentiated by the size of their eardrums, which are located behind their eyes. How does this relate to asana? Mandukasana or Frog Pose, invites us to sit and listen. In time and with practice, the asana helps us find stillness and tap into our intuition like a frog. In a tabletop position, slide your knees wide until you feel a gentle stretch. Feet open up behind your knees, turn your flexed feet outward, inner arches toward the ground. With your shoulders over your elbows, place weight throughout your forearms and hands. Your wrists may stay in front of the elbows or form a triangle for support. Relaxing and allowing your hips to be heavy helps utilize gravity to guide your pubic bone downward. Lengthen through your spine by pressing the crown of your head forward, shoulders down the spine, and tailbone toward your heels. Yogi tip: Micro-movements of the hips, like rocking forward and back, small circles, or cat stretch/cow tilt with your tailbone, can help stretch and release tightness of the hip joints. 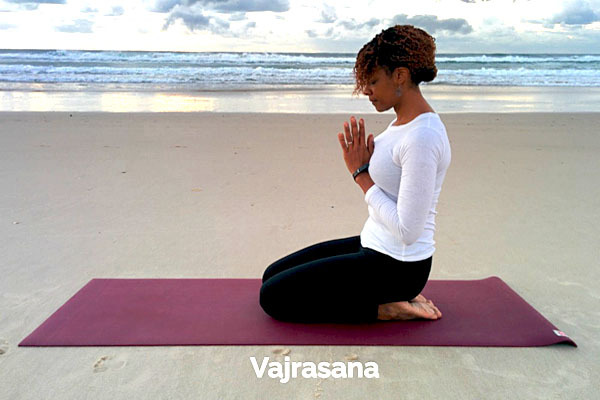 Start in a Vajrasana (pictured), kneeling position sitting on the heels. Inhale, make fists with your fingers wrapping around your thumbs, and place your fists at your navel. Exhale as you bend forward, placing pressure on the navel region as your chest reaches toward your thighs. Like a frog, open your eyes and maintain stillness for as long as possible. Yogi tip: Focusing on inhaling and exhaling slows down the sympathetic nervous system or your fight or flight response. If you are being more mindful of your knees, feel free to fold your mat from both ends to help support your body weight. Putting an additional blanket under the knees may also help you get more comfortable. In the wide-legged variation, blocks underneath your forearms can help alleviate pain in the spine or hips. If you are suffering from a peptic or duodenal ulcer, severe back pain, ankle or knee injury, cardiac pain/problems and/or undergone abdominal surgery, it is best to avoid this asana. Mental – Like a frog, this pose invites deep breathing and expansion of the lungs. Purposeful breath work in this asana helps relieve headaches, stress, and mild depressive symptoms. In addition, focus on the exhale helps remove toxins in the lungs, decrease the heart rate, and release stress induced anxiety. Physical – This asana has amazing benefits for improved lung power. Subsequently, intentional circulation of air through the chest and abdomen helps tone the primary (diaphragm and intercostal muscles) and secondary respiratory muscles. Mandukasana also stimulates the pancreas which improves secretion of insulin. It has been linked to treatment of constipation, diabetes, and digestive disorders as well as improvement in sciatica for some people because the knee and ankle joints are stretched, and the shoulder and abdomen muscles are strengthened. It reduces belly fat by firing the core and fueling the inner flame. Lastly, it helps reduce menstrual cramps (fun fact: the uterus is the strongest muscle in the body). Spiritual – Mandukasana activates the muladhara chakra or the root chakra, located at the base of the spine, the pelvic floor, and the first three vertebrae. The root chakra is responsible for your sense of safety and security. Balancing the root chakra is essential because it is the foundation for opening the other chakras. Therefore, Mandukasana is attributed to helping awaken the Kundalini. Additionally, the asana balances the ida and pingala nadis for meditation. This is in no way an exhaustive list, so if you have found or personally experienced the amazing benefits of Frog Pose, share them with the community below!